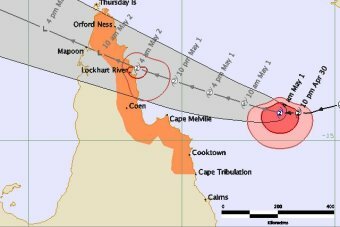 The weather bureau is predicting a category 1 cyclone will cross the Cape in the Lockhart River Region on late Wednesday or Thursday Morning. Black Star will give hourly up dates on the movement of the cyclone via the WAN service to Lockhart River. The unique system allows up to date information to be broadcast to the community over their local radio station within minutes of receiving the information from the Cairns Hub. A comprehensive Black Star news and weather service on the hour will also keep the community informed of the movement of the cyclone. The disaster management team for the region is in contact with Black Star and messages will be relayed from them to the community and from updates from the Bom.Gov.au web site. Gilmore Johnson the network coordinator for Black Star will coordinate the information and schedule it into the system for play out, this is the second cyclone for the season and we are becoming old hands at it now.